With the latest release of recent orchestral works Kenneth Fuchs reaffirms his stature as one of the US's very most distinguished living composers. We hear four works on Piano Concerto "Spiritualist" (and other works) (Naxos 8.559824) and immerse ourselves in masterful and vivid scoring-orchestrations and inventions. All of the music literally lifts itself out of your speakers and enters your musical self in ways increasingly riveting the more you listen. Perhaps like Aaron Copland before him, there is a pronounced feeling of US locality in this music, though none of it is programmatic in that way. The music resounds with a clarity of purpose and in the end a kind of spirit of the New World. It isn't though that you should listen for quotations from old folk songs or the like, because they are not put into the music. So in that sense this is not really Nationalist fare. But in various ways the contemporary vernacular music playing in our heads is always somehow near, perhaps just around the corner. The soloists and the London Symphony Orchestra under conductor JoAnn Falletta make of these World Premiere Recordings something definitive and exemplary, though as ever in these instances other recordings will no doubt in time highlight an aspect or two we might not now be looking for. That does not matter for us at the moment. For this program brings us the music in a shining light. The album features three new concertos and a song cycle. All stand out as very worthy new examples of the orchestral art. The program begins with the "Piano Concerto 'Spiritualist' (After Three Paintings by Helen Frankenthaler)" (2016). The late painter's Color-Field brilliance is aptly and effectively put into musical terms in a buoyant and bouncingly boisterous romp. The solo piano part has a pronounced momentum that translates the visual into the aural with ultra-pianistic means. The orchestral parts follow the mood with a real presence. "Poems of Life (Twelve Poems by Judith G. Wolf for Countertenor and Orchestra)" (2017) changes the mood to one of contemplative retrospection, with a feeling of loss and then a spiritual regeneration. The countertenor role, sung brilliantly by Aryeh Nussbaum Cohen, takes center stage and retains it throughout, with orchestral mists, hues and refracted colors enhancing the poetic mode. It is a music of wonder and experience I suppose you might say. Beautiful. The Concerto for Electric Guitar and Orchestra, entitled "Glacier" (2015), makes beautiful use of the electric instrument in idiomatic ways, with even a nod to Metal stylistics. The overall feeling for the music is a kind of majestic pointedness. The orchestral part is resonant with color and melodic punch. The final work, "Rush (Concerto for Alto Saxophone and Orchestra)" (2012) concludes the program on a rousing note. 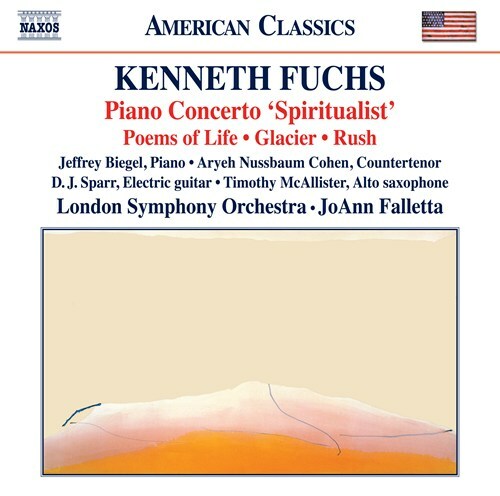 For the moment we have the latest work of Kenneth Fuchs in a major new release. It is in every way a great thing, in performance quality, sound quality and quality and variety of compositions. If you do not know Fuch's music this is the perfect chance to become familiar. If you already do it is a valuable addition to your New Music library. Highly recommended.